This post is part of #Salsafy campaign hosted by #CollectiveBias the social shopper media company. All opinions are mine alone. 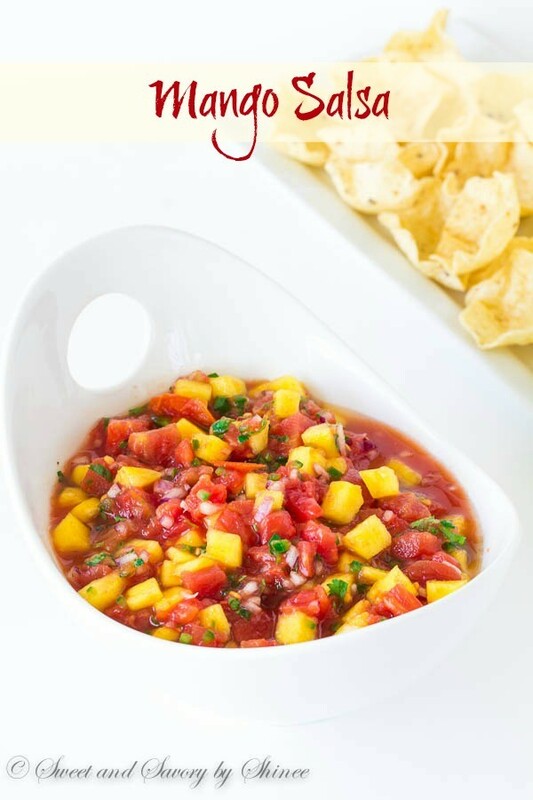 Bursting with delicious summer flavors, this mango salsa comes together in less than 10 minutes with only handful of ingredients! What a beautiful morning! The windows are wide open, mild wind is blowing in, kids laughter is coming in from outside, birds are chirping… I can finally say that it feels like summer! And no, it’s not Friday! I’m just popping in on a random Thursday to share with you a fun, summer-y recipe, since tomorrow is reserved for my April obsessions. Plus, I simply can’t wait any longer. 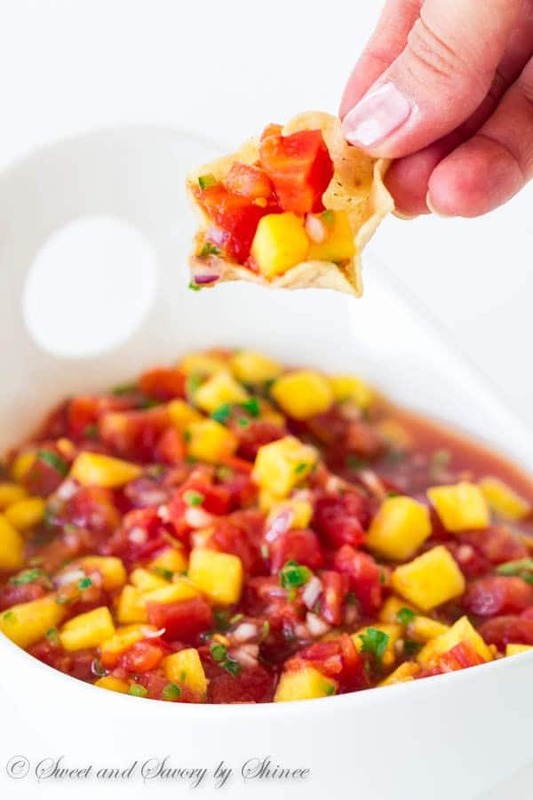 You need this mango salsa in your life. It’s ridiculously easy and quick to make!! Like you will be devouring this dip in less than 10 minutes. Not kidding you. Here is my secret: Hunt’s diced tomatoes! Such a time saver, yet no compromise on flavor. Yes, I use canned tomatoes (not all year round, of course), and I love it! Ok, moving on. Here is another secret for maximum flavor in minimum time. A little bit of red onion and jalapeño are finely chopped and marinated in lime juice for about 5 minutes. This method softens the pungent flavors and creates perfect base for the salsa. And one more little trick for you. (I’m in a good mood today and giving away all my secrets!) Before chopping the cilantro, tightly gather the leaves, place your knife on its side on top and smash a few times (same way you crush garlic cloves). It releases the strong flavor (like when you bruise the mint) and evenly distributes the flavor in the salsa. I’m telling ya, ton of flavor in little time! Now, all you need is mix everything and dig in! How easy is that? 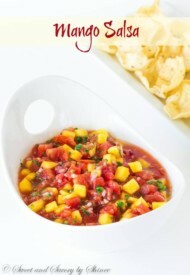 I love serving my mango salsa with tortilla scoops, so that I can fill it with all the juicy, sweet goodness! Pair it with guacamole and a glass of margarita, and you’re set for Cinco de Mayo! Hope you enjoyed my summer mango salsa. Now your turn, tell me what is your favorite salsa? Cut the mango into small cubes. Add the mango, tomatoes, cilantro and salt into the onion mixture. Mix well. *Before chopping the cilantro, tightly gather the leaves, place your knife on its side on top and smash a few times (same way you crush garlic cloves). It releases the strong flavor (like when you bruise the mint) and evenly distributes the flavor in the salsa. Can you can this salsa ?? Hi, Bill. I don’t think so. I never tried canning this, but the mango doesn’t seem right for canning. Right?? I’d happily have those 2 every day! Hi Shinee, I made these the other day on a pulled chicken nachos recipe and it worked out wonderfully! Thanks so much for this wonderful idea. It’s one of the best salsa recipes I had so far. Will cook it again for sure, especially during summer! 🙂 Thanks again for sharing this wonderful recipe! Maggie, I’m so glad you enjoyed this salsa! And pulled chicken nacho sounds amazing! Thank you for your feedback! The canned tomatoes /// sheer genius! Our mangos are just starting to drop…There are too high in the tree to be picked so we wait for them to drop. There is batch of this salsa in my future for sure! You have a mango tree? I’m so jealous, Myrna! You’ll love this salsa, it’s our favorite! I’m so ready for summer produce! Thanks for posting. Hello from Project Inspired. Visiting from ‘Buns in my oven whats cooking wednesday’ link party. 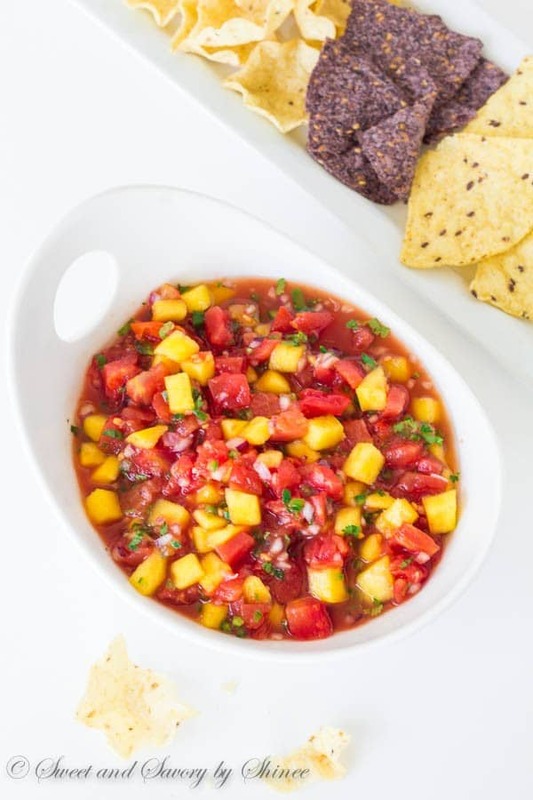 I just made a pineapple avocado salsa, but this mango salsa looks delicious! I like the idea of using a can of diced tomatoes, so much easier! Thanks for sharing. Pineapple avocado salsa sounds amazing, Jessica! Canned diced tomatoes are such a time saver. Thank you! 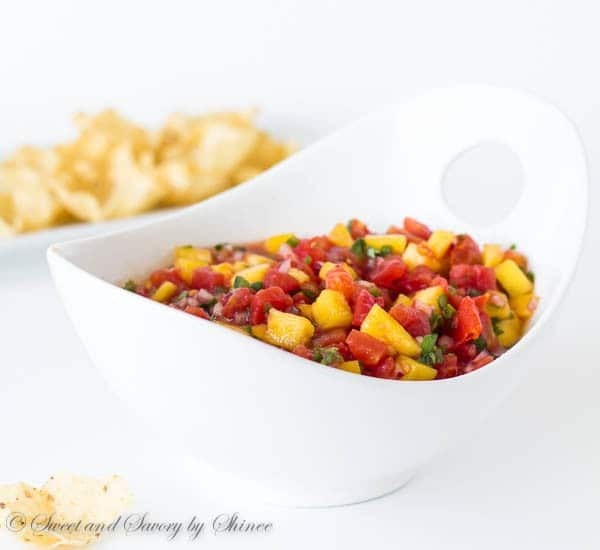 Love, love, love mango salsa but usually just buy it at the store! I’d love to try making it and this looks like a great recipe! And oh so easy! 🙂 Thanks, Lisa. I made it and my tongue got so little burned by eating it after an hour. Oh no, did you use one jalapeño? Drink some cold milk, it should help. Yum! This looks and sounds so good! i am pinning this recipe so that I can try it out later on and share with others! Thanks for sharing! You’re welcome, J! I’m glad you liked it. I’ve actually never had mango in my salsa before but this screams Summer! It sure does, Arman! And give it a try and let me know what you think. Thanks as always for stopping by! One of the most beautiful looking salsa I have seen. Looks so delicious! Thank you so much, Michelle! I loved the colors too! Haha need a napkin? 🙂 Thanks, Lily! Yay! I’m so glad you learned something here. 🙂 It’s a nice shortcut. Thanks, Medha! Yummy! 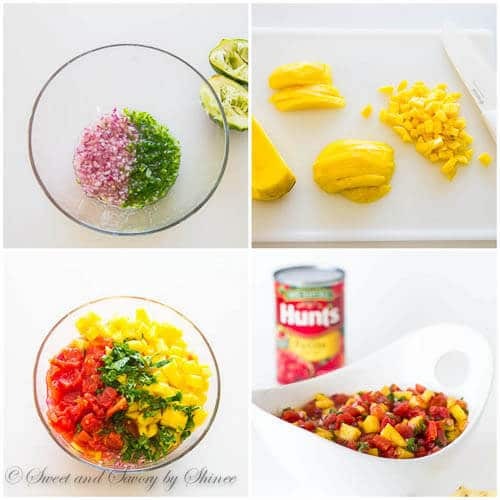 I love mango salsa, especially as a dressing for tacos. This looks so refreshing and perfect with chips! Oh yeah, this over tacos… yum! Thanks, Beeta!